I’ve been wanting a pair of Golden Goose sneakers for what seems like forever, and I finally found a pair I felt strongly enough about to splurge on! If you’ve never heard of Golden Goose, you’ll probably be surprised when you see the price. They are NOT cheap! My sister has a couple pairs, as do several of my friends (bloggers and non-bloggers alike! ), and after hearing how comfortable they were I knew I had to get a pair. While I could have gone with a more classic and neutral color palette, I figured I can always find sneakers in those colors, plus I already have several great neutral sneaker styles in black, white, grey, and beige. When I saw this fabulous autumn color scheme, however, I knew they would be one-of-a-kind. 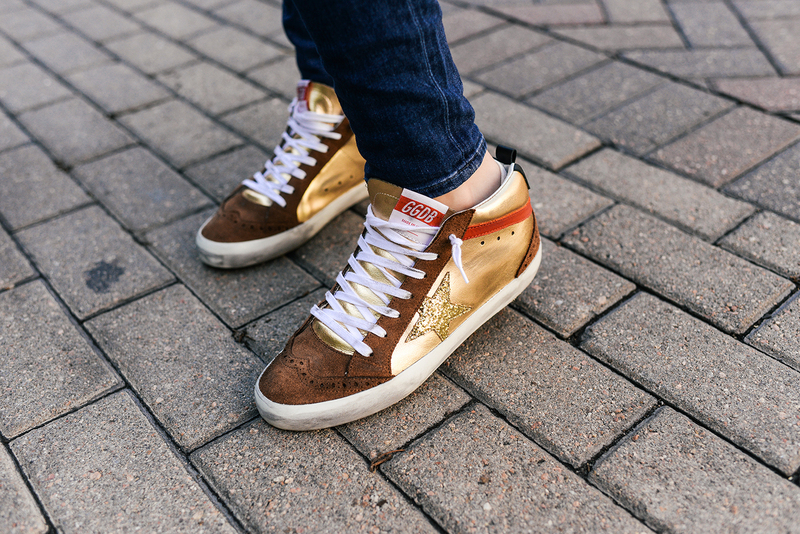 The rich brown suede, striking gold leather and red accents make them the perfect casual shoe for fall! You’d think with so many strong colors on them they’d be hard to wear, but these sneakers look great with SO MUCH. I’ve only owned them for a week and have already worn them four times. The best part of these shoes is there’s no downtime needed to break them in. They are comfortable all day on the very first wear! They’re also ideal for travel as they’re meant to be worn loose as shown above, and can be quickly slipped on and off in a jiffy. Anyway, if you’re looking for a unique, chic and comfortable pair of sneakers, I highly recommend investing in a pair by Golden Goose – totally worth the splurge! As far as sizing goes – I’m wearing a 40 and normally wear a 9.5. 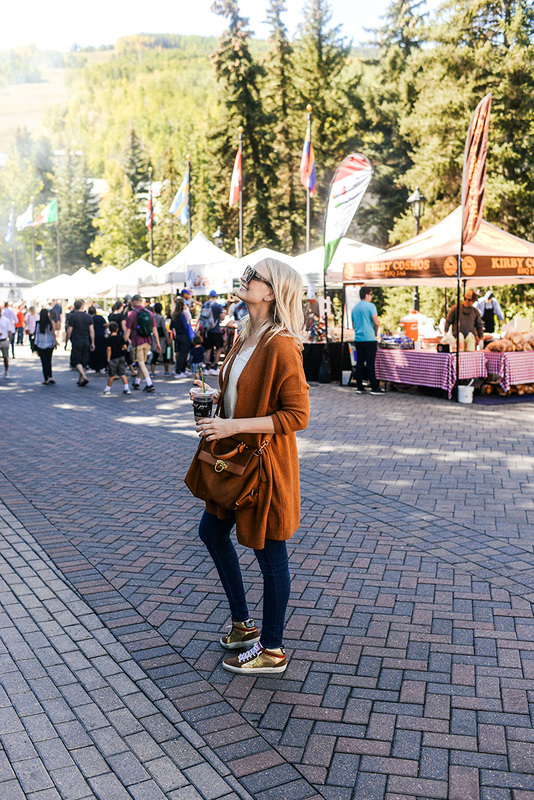 One of the days I wore them on my trip was to the Sunday Farmers Market in Vail Village. We spent a couple hours sidling through the streets, trying things from various vendors like crepes, paella, Hawaiian wafer crackers, and more! 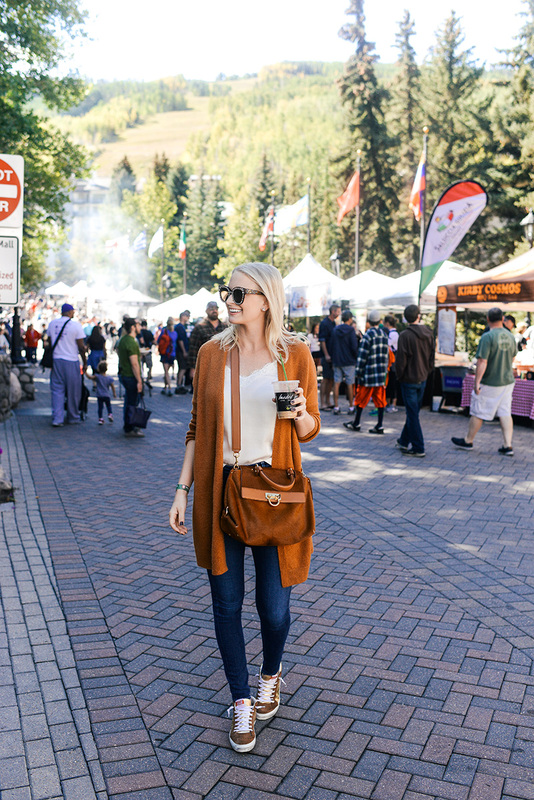 In keeping with the fall feels in Colorado, I paired my new sneaks with my favorite skinny jeans and this $51 cardigan. 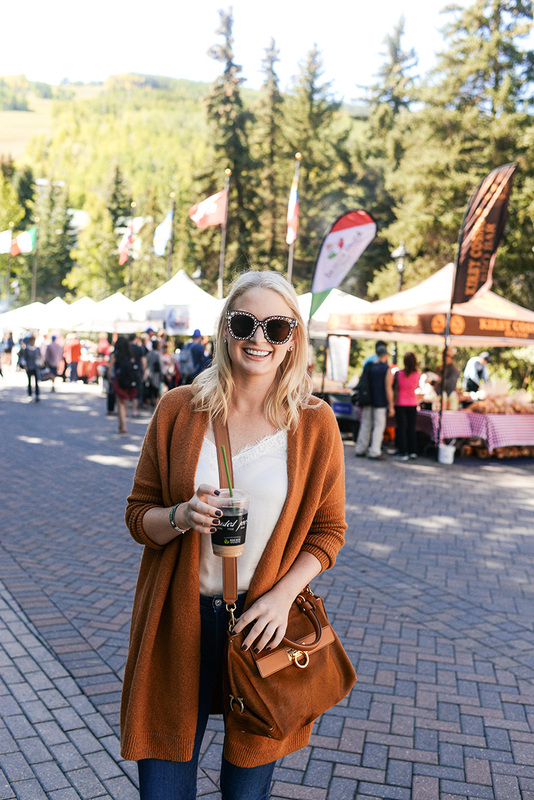 It’s such a pretty autumn hue and a cute + cozy addition to my wardrobe, don’t you think? Don’t miss more of my favorite Golden Goose sneaker styles and colors below! For more fall/winter vibes, check out this leopard-print calf hair pair. Too cute! If you’re more of a classic + clean gal, this pair may be the one for you. If you love brights, don’t miss this pink glitter pair – they also happen to be on sale! 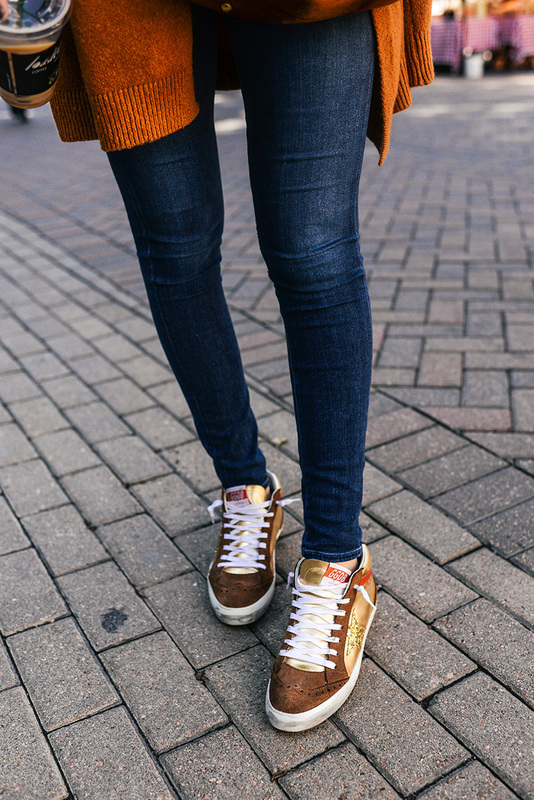 These white sneaks with bronze accents would be a nice everyday neutral pair to have. If bordeaux is a color you love and/or wear a lot, don’t miss these velvet sneakers. Another wild pair I’m loving? Gold glitter + black details. SO FUN. After getting my first pair I was hooked I eventually got 3 more, they are the most comfortable sneakers ever. Love this one! Do I size up or down if I’m between sizes? I’m 6.5 . I bought a 40 and usually wear a 9.5 – so you might try a 37… hope this helps! Good to know they’re worth the splurge! Having comfortable shoes makes it all worth it!